Aim or objective The aim of this study is to consolidate studies of physiological measures following sport-related concussion (SRC) to determine if a time course of postinjury altered neurobiology can be outlined. This biological time course was considered with respect to clinically relevant outcomes such as vulnerability to repeat injury and safe timing of return to physical contact risk. Data sources PubMed, CINAHL, Cochrane Central, PsychINFO. Eligibility criteria for selecting studies Studies were included if they reported original research on physiological or neurobiological changes after SRC. Excluded were cases series <5 subjects, reviews, meta-analyses, editorials, animal research and research not pertaining to SRC. Results A total of 5834 articles were identified, of which 80 were included for full-text data extraction and review. Relatively few longitudinal studies exist that follow both physiological dysfunction and clinical measures to recovery. Summary/conclusions Modalities of measuring physiological change after SRC were categorised into the following: functional MRI, diffusion tensor imaging, magnetic resonance spectroscopy, cerebral blood flow, electrophysiology, heart rate, exercise, fluid biomarkers and transcranial magnetic stimulation. Due to differences in modalities, time course, study design and outcomes, it is not possible to define a single ‘physiological time window’ for SRC recovery. Multiple studies suggest physiological dysfunction may outlast current clinical measures of recovery, supporting a buffer zone of gradually increasing activity before full contact risk. Future studies need to use generalisable populations, longitudinal designs following to physiological and clinical recovery and careful correlation of neurobiological modalities with clinical measures. How does the time course of physiological recovery compare with the time line of clinical recovery after sport-related concussion (SRC)? Should there be a minimum stand-down period following SRC? Is the duration or content of graded return to play progressions appropriate? To identify relevant articles, we searched PubMed, CINAHL, Cochrane Central and PsychINFO. In order not to miss potentially relevant studies and because of the broad range of physiological markers, our search strategy included five search categories (exercise tolerance, brain physiology, advanced brain imaging, blood/serum biomarkers and functional assessment of physiology) (table 1). The initial search, designed in collaboration with the lead authors and two biomedical librarians, resulted in 7175 records (figure 1). 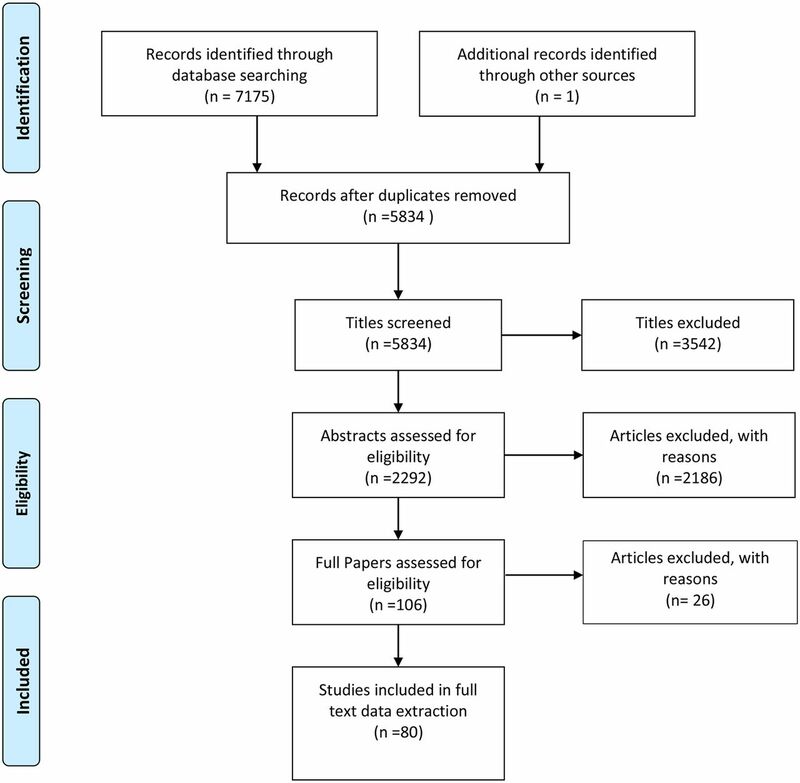 Authors of this systematic review were asked to contribute any papers missed by the initial search, resulting in one addition. After removing duplicates, there were 5834 unique records. Two reviewers independently screened the titles of each record and excluded irrelevant studies or non-primary literature. 2293 records remained after this step. After applying exclusion criteria between two independent reviewers, 106 articles remained. The exclusion criteria were as follows: case reports, case series with <5 subjects, review articles, meta-analyses, editorials, animal research and research not pertaining to SRC. There were no discrepancies in applying the exclusion criteria. Six pairs of reviewers independently extracted relevant data, rated bias and level of evidence and removed an additional 26 papers that did not address the relevant questions, resulting in a final set of 80 studies. We used the Newcastle-Ottawa Scale to assess the risk of bias in included articles (using either the case–control or cohort version, depending on the article http://www.ohri.ca/programs/clinical_epidemiology/nosgen.pdf). Case series and cross-sectional studies were not ratable. Level of evidence was graded for each article with the Strength of Recommendation Taxonomy (SORT) (http://www.aafp.org/afp/2004/0201/p548.html). After the initial independent extraction and for all subsequent ratings of the level of evidence and risk of bias, each reviewer pair had to reconcile their ratings or a third ‘tie-breaker’ reviewer made the final determination. A major challenge of this review is the broad range of modalities that were considered as potential physiological markers after concussion. As each modality has distinct measurement methods, biological significance and time course, it was not possible to combine all modalities into a single ‘physiological’ metric. The authorship group determined that dividing the studies into discrete categories would allow for the most succinct and useful information, which might then be stratified by the level of evidence and applied to the questions. Papers that included more than one physiological category were evaluated and rated separately for each category. The three questions to be addressed overlap in that they require comparison of physiological markers to a time course of clinical markers that are indirectly related to risk and recovery and, in the absence of a definitive answer to question 1, the ability to delineate specific answers to questions 2 and 3 was extremely limited. The categories of physiological markers for each modality were as follows: (1) functional MRI (fMRI), (2) diffusion tensor imaging (DTI)/diffusion MRI, (3) magnetic resonance spectroscopy (MRS), (4) cerebral blood flow (CBF), (5) electrophysiology, (6) heart rate, (7) response to exercise, (8) fluid biomarkers and (9) transcranial magnetic stimulation. Although the number of studies varied between physiological categories, the overall level of evidence between categories was similar with almost all studies rated level 3. Thus, no single physiological marker category was clearly superior to the others. Each category will be summarised below, with a more detailed evidence table provided in the online supplementary materials. While most of the articles reviewed did not specify exact criteria for concussion diagnosis, in general, they did require clinical diagnosis by an experienced healthcare provider. Summary: Changes in fMRI activation vary based on brain regions of interest, different time points studied and analytical method. There is a relative dearth of studies monitoring patients until full physiological recovery. fMRI can be used to examine brain activation during specific tasks as well as for analysing connectivity at rest. Summary: Following SRC, changes in white matter orientation as measured by DTI are detectable with different methods. Multiple, but not all, studies show persistence of these changes even as clinical symptoms and other measures (behavioural surveys, cognitive testing) tend to resolve over time. Thus, measures of white matter orientation are altered after SRC and may persist beyond clinical recovery. However, it is unclear what biological mechanisms underlie the DTI changes or whether similar changes in diffusivity represent different mechanisms at different time points. Summary: MRS can detect metabolic derangements following SRC. This evidence indicates that metabolic abnormalities may be detected beyond the window of clinical recovery. Preliminary evidence indicates that a repeat injury when the brain is metabolically vulnerable prolongs recovery. Additional work demonstrating the effect of repeat injury after clinical recovery, but before metabolic normalisation, will be required to determine whether metabolic recovery should be used to guide RTP recommendations. Summary: Mounting evidence suggests an alteration of CBF following SRC, but the time course is not certain. Further longitudinal studies are needed to elucidate the acute versus chronic effects. The single study showing converse changes in blood flow depending on symptom level suggests that altered CBF may not definitively signify ongoing dysfunction. Summary: Various methods using ERP and several novel EEG algorithms have shown an electrophysiological effect of SRC. More longitudinal studies are needed to distinguish acute concussion physiology from remote effects of prior trauma. Two studies finding significant effects on EEG at 8 days post injury and recovery at 45 days after injury indicate possible physiological perturbations detectable after clinical recovery. However, given the proprietary algorithms that were used in these studies, replication will be needed before any definite conclusions can be made. Summary: There is currently no specific modality or time course of cardiac function that delineates concussion recovery or correlates well with existing measures of clinical recovery. Summary: There is insufficient evidence to delineate an accurate window of postinjury physiological dysfunction as related to exercise tolerance in the acute and subacute periods. Summary: There are no reliable markers to monitor recovery from SRC. Fluid biomarkers have the potential to help inform either diagnosis or monitor for recovery after concussion. Before they may be recommended for clinical use, however, their utility must be demonstrated in longitudinal studies with limited attrition and clinical recovery as the primary outcome. Summary: In two articles, there were persistent abnormalities in cortical excitation beyond the window of clinical recovery. Another study found electrophysiological dysfunction acutely after SRC that did not correlate with symptoms. Further experiments are needed to define the time window of altered cortical excitability after SRC. There is a broad range of different physiological measures studied after SRC, each of which almost certainly has a different time course, severity, method of measurement and clinical significance. These factors make it impossible to produce a single ‘physiological time-window for concussion recovery’ metric. The real-world significance of each physiological modality should be delineated by its relationship to existing clinical parameters. The first step is to better determine the relationship between pathophysiology and known clinical symptoms or signs of neurological dysfunction. Understanding connections between physiological parameters and increased vulnerability to repeat concussion or to more severe acute/subacute symptoms is important for clinical management of return to activity/return to play. Correlation of pathophysiology to longer term risk of chronic or degenerative problems is more difficult and requires prospective, longitudinal study designs with extended follow-up. The literature reviewed here reflects evidence directed at showing biological changes after SRC. It is possible that measurable brain changes occur after repeated brain impacts in the absence of clinically diagnosed SRC, sometimes termed ‘subconcussion’. Whether these brain changes confer resiliency, vulnerability or have no clinically measureable effect remains to be seen. However, by focusing on clinically diagnosed concussions in this review, the physiological changes and their time courses summarised here may or may not be relevant in the sports setting where repeated impacts also occur without recognition or diagnosis of a concussion. This review clearly revealed major limitations to the existing body of evidence relating to pathophysiological recovery after SRC. The most glaring study design limitation is a scarcity of longitudinal cohort studies that follow patients until resolution of the physiological dysfunction and correlated it to clinical recovery measures. This is crucial to find the duration of clinically relevant neurobiological dysfunction. Most included articles were cross-sectional design (with single time points) or cohort studies that did not follow subjects to full recovery. Where possible, analysis of the consequences of repeat injury occurring before normalisation of physiological changes may be enlightening if a linkage can be established between repeat injury, pathophysiology and clinical dysfunction. Such studies may be difficult and require large observational cohorts. However, it is possible to examine pathophysiological risk using preclinical animal models. The generalisability of individual studies with small sample sizes is limited, given frequent selection biases, unique study populations and inappropriate or absent controls. There is a common theme of finding significant results using very sensitive methods with uncertain clinical significance. These studies are prone to bias, particularly with computational analyses of advanced imaging or electrophysiology, and the results should be interpreted cautiously. All physiological studies are hindered by the absence of a gold-standard clinical definition of concussion and thus are threatened by measurement bias. This is heightened by the lack of consensus on what is deemed ‘recovery’, especially in the light of ongoing chronic premorbid symptoms such as chronic migraine or mood disorders. Methodologically, this systematic review is subject to publication and language bias as we reviewed only articles published in English. How does the time course of physiological recovery compare with the time line of clinical recovery after SRC? The time course of recovery for multiple physiologically measurable parameters appears to exceed clinical recovery. A definitive time point for physiological recovery after SRC is yet to be determined. Reliable studies of MRS and CBF appear to demonstrate a physiological disturbance for greater than 15 days but less than 30 days after injury. This is not only longer than the average clinical time to recovery in adults, but in individual papers there was evidence of clinical recovery prior to physiological recovery.36 37 40 The time course of biological disturbance is less clear with other modalities like DTI, electrophysiology and fluid biomarkers. Longitudinal studies are necessary to characterise the progression of physiological recovery. It is unclear whether changes in neurobiology represent dysfunction, vulnerability or recovery. It is prudent to incorporate a ‘buffer zone’ of gradually increasing cognitive and physical activity between the time of neurological (symptomatic) recovery and return to full contact risk. There is limited clinical evidence that repeat concussion during the window of neurometabolic disturbance leads to prolonged recovery. Therefore, from a physiological standpoint, we are unable to determine whether there needs to be a minimum stand-down period after injury. The most rigorous evidence regarding this still comes from animal data where intersubject variability is low, injury severity consistent and time points are precise. These studies show vulnerability81 82 if a repeat injury occurs before complete metabolic recovery. The duration of this time window in humans with concussion is unclear. The significance of ‘subconcussive impacts’ and biological changes reported after playing contact sports for a set time are also unclear. Animal and human studies indicate that repeat concussion prior to recovery result in more severe and prolonged physiological and clinical disturbances. This supports immediate removal from contact risk after an identified injury. As there is (are) currently no standard biomarker(s) for physiological dysfunction underlying vulnerability to repeat concussion in humans, the stand-down time should be determined by thorough clinical assessment. There is insufficient evidence to recommend a change to the current graded return to play progression. To answer this question, there is need for data on the effect of repeat brain injury and the effect of exercise on ongoing concussion physiology. These studies need to be adequately powered, have a longitudinal component, use one or more potential clinical correlates and have appropriate controls. Such studies are necessary to determine the time course of both physiological and clinically measurable dysfunction. Longitudinal analyses are important in determining whether subclinical changes become clinically relevant with ageing or later developing disease processes. Outcomes from such studies need to be carefully defined with respect to risk of repeat injury, risk of new musculoskeletal injury, risk of worsened symptoms, prolongation of recovery, neurocognitive impairment or chronic neurodegeneration. Further studies investigating physiological biomarkers of concussion should be undertaken. These studies should select generalisable populations, implementing longitudinal cohorts that follow patients to physiological and clinical recovery and examine the relationship between physiological disturbance and clinical outcomes. While not specific to this question, our understanding of concussion physiology would certainly benefit from more objective diagnostic and recovery criteria, and research to better define ‘concussion’ and ‘recovery’ is a high priority. Given the limitations of the available data, we recommend that medical providers continue to use clinical data to manage return to play while reserving physiological metrics for research until more conclusive data are obtained. This review shows that the window of physiological dysfunction can outlast that of clinical recovery. These data support using a ‘buffer zone’ of a graduated return to activity/return to play progression before full return to contact risk.
. The NCAA concussion study. J Am Med Assoc 2003;290:2549–55.
. HHS public access. Brain Imaging Behav 2014;67:223–30.
. Exercise treatment for postconcussion syndrome: a pilot study of changes in functional magnetic resonance imaging activation, physiology, and symptoms. J Head Trauma Rehabil 2013;28:249–241.
. Repeat traumatic brain injury in the juvenile rat is associated with increased axonal injury and cognitive impairments. Dev Neurosci 2011;32:510–8. Acknowledgements We thank our UCLA Biomedical Librarian, Rikke Ogawa and her colleague Bethany Myers, who assisted with development of the search strategies and conducted the literature searches. We are also very grateful to Philip Rosenbaum for assisting with organisation of the project, managing the reference library and proofreading and Joshua Stanley for assisting in data extraction. Competing interests JK—Fellowship partially supported by UCLA Steve Tisch BrainSPORT programme. EB—grants/research support: National Institute of Child Health and Human Development (grant Nos 5R01HD048946 and 3R01HD048946-05S1) and the USA. Army Medical Research and Material Command under Award No W81XWH-13-2-0095 (Chronic Effects of Neurotrauma Consortium); Director—Neuropsychological Research and Assessment Lab at BYU's Comprehensive Clinic. Medicolegal: Some forensic cases. TC—grants/research support: Brainscope, Datalys, Pentecost Foundation. SK—Chief Medical Officer, Rugby Football Union; Committee Member: World Rugby Head Injury Assessment Working Group and Football Association Independent Panel on Concussion and Head Injury. JJL—grants/research support: NIH, The Ralph C. Wilson Foundation, Program for Understanding Childhood Concussion and Stroke, The Robert Rich Family Foundation and The Buffalo Sabres Foundation. AM—grants/research support: NIH, US Dept of Defense, NSF. MMC—grants/research support: US Dept of Defense, US Dept of Veteran’s Affairs, NCAA, NFL-GE, GE Health Care, MCW CTSI, private donors; Consultant: Green Bay Packers; Past member: NFL Head, Neck and Spine Committee (w/o compensation); Member: GE Healthcare Medical Advisory Board, Board of Governors for International Neuropsychological Society. KJS—Consultant, Evidence Sport and Spinal Therapy; speaking honoraria for presentations at scientific meetings. TCVM—Trustee, United States Brain Injury Alliance; Senior Associate Editor: Journal of Athletic Training, Associate Editor: Journal of Sport Rehabilitation; Consultant, Concussion Health. RZ—grants/research support: CIHR, Ontario Neurotrauma Foundation, Ontario SPOR Support Unit, Clinical Research Chair in Pediatric Concussion, University of Ottawa Brain and Mind Institute. CCG—grants/research support: NIH, NCAA, US Department of Defense, Today’s and Tomorrow’s Children Fund, UCLA Brain Injury Research Center, UCLA Faculty Grants Program, UCLA Steve Tisch BrainSPORT programme, Avanir (research grant 2017-2018), NINDS Neural Analytics SBIR grant (2016-2018); Consultant: NFL—Neurological Care Program, NHLPA, Neural Analytics Inc (2015-16); Advisory Panel: LoveYourBrain, MLS, NBA, NCAA, USSF; Medicolegal: One or two cases annually; Speaker’s Bureau: Medical Education Speakers Network.